Breaking: Obama leváltja a rankingeket? The department is considering a measure of the gap between the Expected Family Contribution (EFC) and total cost of attendance not covered by financial aid. 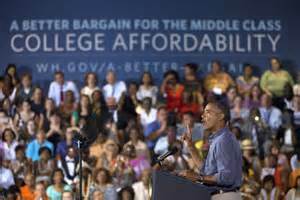 A measure that would seek to identify the number of low- and moderate-income students a college enrolls. The percentage of enrolled students who did not have a parent who attended college. A measure of the cost of attendance after accounting for all federal, state and institutional grant aid. This metric links net price to family incomes, but is only available for students who receive federal aid. Federal IPEDS graduation rates, which track only first-time, full-time students. Scheduled to expand to broader metrics in 2017. The department is exploring an alternative completion rate metric based on data from the National Student Loan Data System. Also on the table is a measure of student-transfer rates, with particular attention to two-year college students who earn bachelor’s degrees. The department is looking at a variety of employment outcome measures that track student earnings. The department is considering a measure of graduate-school attendance rates of former students within a defined period, such as a decade. Metrics such as the percentage of students who repay loans on time would help consumers weigh specific colleges.